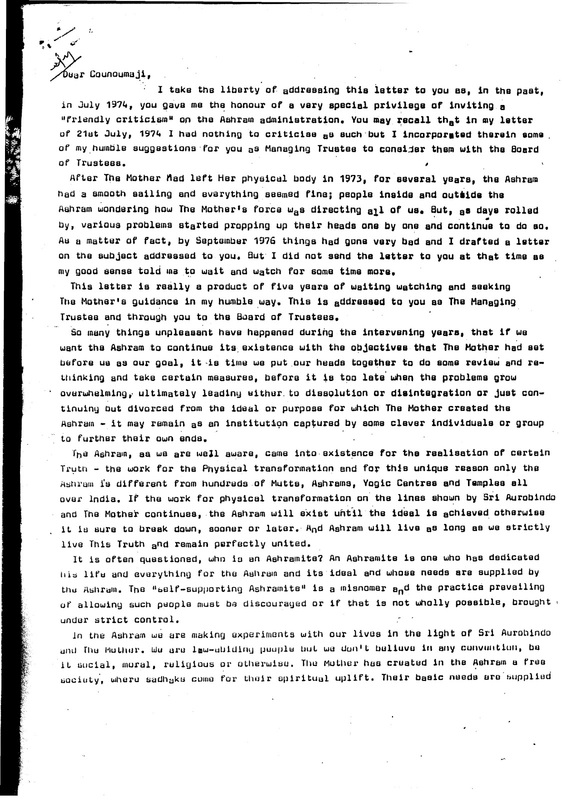 I take the liberty of addressing this letter to you as, in the past, in July 1974, you gave me the honour of a very special privilege of inviting a “friendly criticism” on the Ashram administration. 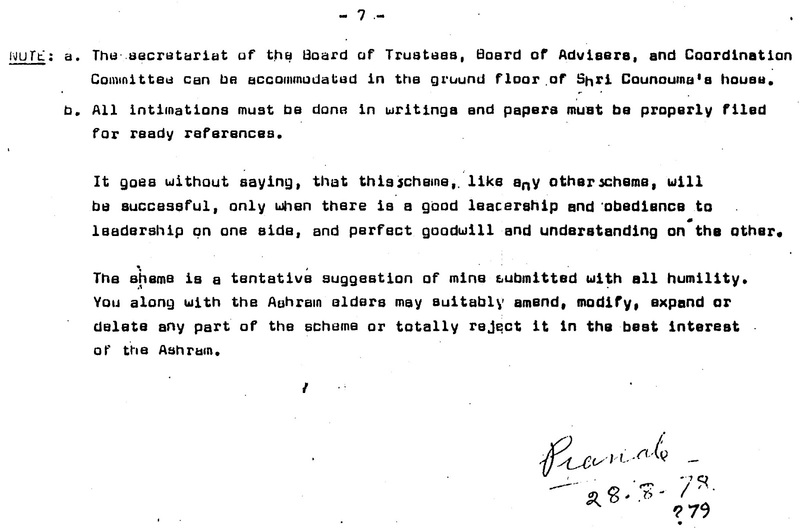 You may recall that in my letter of 21st July, 1974 I had nothing to criticise as such but I incorporated therein some of my humble suggestions for you as Managing Trustee to consider them with the Board of Trustees. 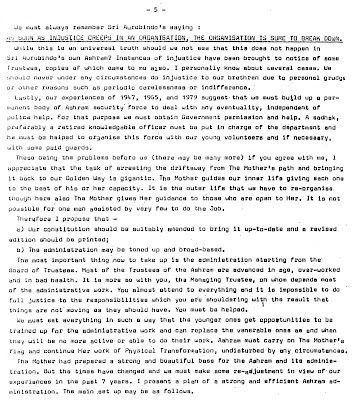 After The Mother had left Her physical body in 1973, for several years, the Ashram had a smooth sailing and everything seemed fine, people inside and outside the Ashram wondering how The Mother’s force was directing all of us. But, as days rolled by, various problems started propping up their heads one by one and continue to do so. As a matter of fact, by September 1976 things had gone very bad and I drafted a letter on the subject addressed to you. But I did not send the letter to you at that time as my good sense told me to wait and watch for some time more. This letter is really a product of five years of waiting watching and seeking The Mother’s guidance in my humble way. This is addressed to you as The Managing Trustee and through you to the Board of Trustees. 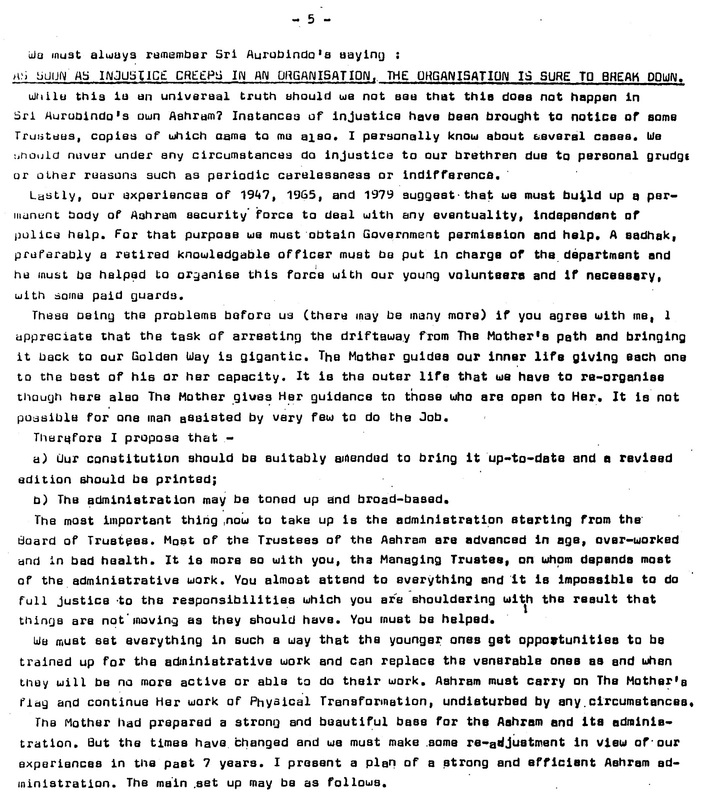 So many things unpleasant have happened during the intervening years, that if we want the Ashram to continue its existence with the objectives that The Mother had set before us as our goal, it is time we put our heads together to do some review and rethinking and take certain measures before it is too late when the problems grow overwhelming, ultimately leading either to dissolution or disintegration or just continuing but divorced from the ideal or purpose for which The Mother created Ashram ─ it may remain as an institution captured by some clever individuals or group to further their own ends. The Ashram, as we are well aware, came into existence for the realisation of certain Truth ─ the work for the Physical transformation ─and for this unique reason only the Ashram is different from hundreds of Mutts, Ashram, Yogic Centres and Temples all over India. If the work for physical transformation on the lines shown by Sri Aurobindo and The Mother continues, the Ashram will exist until the ideal is achieved otherwise it is sure to break down, sooner or later. And Ashram will live as long as we strictly live This Truth and remain perfectly united. It is often questioned, who is an Ashramite? An Ashramite is one who has dedicated his life and everything for the Ashram and its ideal and whose needs are supplied by the Ashram. The “self-supporting Ashramite” is a misnomer and the practice prevailing of allowing such people must be discouraged or if that is not wholly possible, brought under strict control. In the Ashram we are making experiments with our lives in the light of Sri Aurobindo and The Mother. We are law-abiding people but we don’t believe in any convention, be it social, moral, religious or otherwise. The Mother has created in the Ashram a free society, where sadhaks come for their spiritual uplift. Their basic needs are supplied by the Ashram and The Mother provides the means to meet them. The sadhaks are given some work for their self-expression and opportunities are provided for an integral progress. The Mother gives everybody Her inner guidance according to the needs and capacities of individuals and keeps the overall control with the pressure of Her consciousness. Sadhaks are required to give their best to the Ashram community as regards their service with an attitude of good will and sincerity and they are left to do their own sadhana for Integral Transformation through dedicated service and self-purification There are necessarily some rules for the practical running of the organisation, but they are not always strictly enforced, for The Mother’s work can only be done in an atmosphere of complete freedom, goodwill and understanding. So, the members of the Ashram have been given the maximum freedom possible. We have accepted this spiritual life, and all that is necessary for the maintenance, continuity, and growth, have been placed at our disposal. The amenities and particular conveniences, which many cannot afford in the life outside, are attracting many people who try to settle here for the conveniences only, even if they have no spiritual seeking nor do they believe in the ideal for which the Ashram stands. There has been a tremendous infiltration of such unwanted people who carry on with their own way of life. We have to stop further infiltration and gradually eliminate them. The Ashram, it is true, is not taking new members as Ashramites at the present, but the practice of admitting people by the back-door continues. Some Ashram departments recruit new members directly and engage them in their departments, provide them with clothes, shelter, some pocket money and Dining Room facilities and all other amenities except being borne on Prosperity. This practice must be stopped forthwith. We cannot look after properly those who are already in the Ashram. Why admit new people to increase the burden by these non-Ashramite non-paid workers? There should be a definite distinction between sadhaks and paid-devotee-workers. There should be no half and half system. The quantum of work done by a devotee paid worker does not make him eligible for all the conveniences of Ashram, particularly sports and playground facilities. The Ashram does not aim at building an ideal farm or an ideal factory with optimum output in view. The Mother made the Ashram to provide opportunities for making ideal men and women who could carry on the work of Sri Aurobindo and The Mother in this world, the inner work being more important than the outer work, though the outer work in true spirit is the manifestation of the inner development and a means for the growth of the inner being. It is time we change our policy regarding taking new members as Ashramites. The first preference should be given to those boys and girls who grew up here under our system of education, have finished their schooling and who sincerely wish to remain with us permanently and who are found out fit and ready to take our spiritual life. Men and women who are non-Ashramite and non-paid workers who have really taken up the spiritual life in right earnest and who have proved their worth by selfless work, discipline and devotion to the work as The Mother’s work, may be next. But before we do so, their antecedents may be verified by reference to responsible people or to police authorities of their places of origin and a thorough medical check-up should be made. They must be very closely screened about their political affiliations, countries of origin and idealism of life and how they are connected with the Ashram or with the teachings of Sri Aurobindo and The Mother. The question of new admission in the Ashram which I have discussed in the preceding two paragraphs can however be taken up only when we are sure of ourselves and can look after properly those who are already in the Ashram. The Mother continues to provide us with sufficient resources to continue Her work. We must be careful that we do not waste anything. We should not allow ourselves to commit mistakes and blunders and for this purpose every project should be examined thoroughly from all angles. But at the same time we must not be stingy about money and spend freely where it is absolutely necessary. The Ashram must feel strongly that it is supported by The Mother’s power alone and strictly observe the principles set down by The Mother. We must never go for a compromise even under strongest pressure from any quarter. We must not ask undue favours, must not beg from anybody and at the same time we must not allow any outsider to interfere with our work. I am sure that if we continue Her work with all sincerity and earnestness, we will never be in want of resources. She will provide us with everything. If we do not act in this spirit, the privilege of serving Her will be denied to us and it will be a great pity, nay, a catastrophe. We should have full control on the earning units of Ashram. Special care and attention must be paid to such units. They must be helped as sympathetically as possible. But it must be seen that they are run on correct lines in conformity with our ideal. It has to be seen that the accounting is done properly and these must be audited periodically. In the agricultural activities, a planned programme must be drawn jointly, the surplus must be marketed and with that money our requirements, that we do not produce, must be purchased. Enquiries must be done to find out the reasons when some departments do not function efficiently. Those must be helped with men, materials and sound advice. We should not be shy of paying due taxes to Government. Where necessary, a strong representation must be sent to Government for justice but we must not go to them with a begging attitude. If necessary we must impress upon the Government that the profit made from our earning concerns goes to the maintenance and welfare of our spiritual community of 1200 people or more. We must try to be independent of Government grant or aid as far as possible. 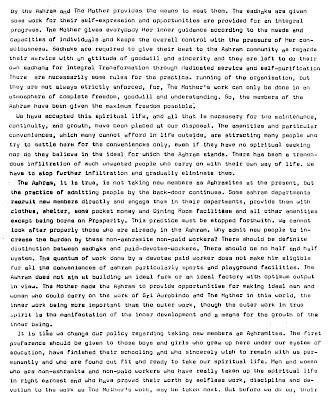 In our relationship with the Government, individually as members of the Ashram, we must obtain from the Government what we are expected to get as citizens of India and collectively, as the Ashram, we must make it sufficiently clear to the Government, that ours is a unique spiritual organisation for the uplift of the consciousness of India and the world, not limited to MOKSHA or LIBERATION of some individuals. A differentiation has to be made however between earning units of the Ashram and sundry businessmen who use or utilise the name of Ashram or Auroville and have no connection with us. It would be wise to give a list of our earning concerns to concerned Government departments declaring we have no concern at all with the others. We must strictly abide by the law of the land. But if circumstances so happen that we are to defend our cause before a law court we must be able to do so from a position of strength. For that purpose we must have an office of good legal advisers, both civil and criminal who will boldly deal with all legal matters including labour cases. We must be very careful to admit in the Ashram even as casual visitors any foreigner and people coming from different parts of India without reference. Visitors unknown to us wanting to remain for quite some time in the Ashram guest houses must have some reference from some responsible men. Though there must be some selected individuals who would do the liaison between Ashram and the outside life, be it Government, public or business, the Ashram in general, including the Centre of Education, must strictly keep away from outside contacts. We have not yet achieved what we have set as our goal. Outside contacts will surely divert our objectives and bring in lot of chaos and confusion. Moreover, our children of the Centre of Education, brought up in an atmosphere of freedom and security do not know how to protect themselves from outside adverse influences. Outside contacts will tempt them to absorb ideas and habits which are not in conformity with our way of life. All possible measures must be taken for the maintenance of total sanctity in the Ashram main building, where the “Physical Envelopes” of Sri Aurobindo and The Mother are lying. There should be no business transaction in the Ashram main building. Only books written by the Mother and Sri Aurobindo in original and their photographs should be sold from there. Our Reception Service must remain open round the clock to attend to the visitors who arrive at any time from train or bus at odd hours nowadays. It must be so arranged that someone is there in the office all the time on shift duty basis. Our Guest Houses are to accommodate only those people who come to the Ashram, for the Ashram alone, and want to stay a few days with us, sharing our way of life. Our Guest Houses must not turn out like hotels, taking anybody and everybody, who come to visit the town for some other interests. Similarly Dining Room facilities will be offered to the genuine visitors of the Ashram. Sadhaks on duty at Ashram main gate must be chosen from people known for amiable and good helping attitude. Rudeness to visitors should be avoided as it reflects on the image of the Ashram. The paid gate-keepers must be organised with care and consideration. We have to look after the needs of sadhaks, especially old sadhaks, and those who have no means to meet their needs with sympathy and consideration. 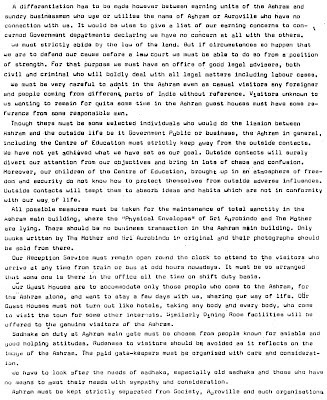 Ashram must be kept strictly separated from Society, Auroville and such organisations. AS SOON AS INJUSTICE CREEPS IN AN ORGANISATION, THE ORGANISATION IS SURE TO BREAK DOWN. While this is a universal truth should we not see that this does not happen in Sri Aurobindo’s own Ashram? Instances of injustice have been brought to the notice of some Trustees, copies of which came to me also. I personally know about several cases. We should never under any circumstances do injustice to our brethren due to personal grudge or other reasons such as periodic carelessness or indifference. Lastly, our experiences of 1947, 1965, and 1979 suggest that we must build up a permanent body of Ashram security force to deal with any eventuality, independent of police help. For that purpose we must obtain Government permission and help. A sadhak, preferably a retired knowledgeable officer must be put in charge of the department and he must be helped to organise this force with our young volunteers and, if necessary, with some paid guards. These being the problems before us (there may be many more) if you agree with me, I appreciate that the task of arresting the drift away from The Mother’s path and bringing it back to our Golden Way is gigantic. The Mother guides our inner life giving each one to the best of his or her capacity. It is the outer life that we have to re-organise though here also The Mother gives Her guidance to those who are open to Her. It is not possible for one man assisted by very few to do the job. b) The administration may be toned up and broad-based. The most important thing now to take up is the administration starting from the Board of Trustees. 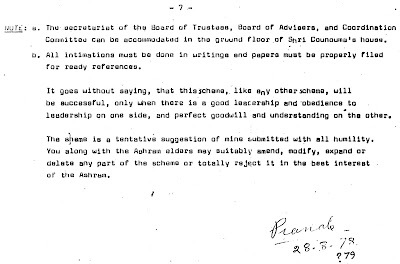 Most of the Trustees of the Ashram are advanced in age, over-worked and in bad health. It is more so with you, the Managing Trustee, on whom depends most of the administrative work. You almost attend to everything and it is impossible to do full justice to the responsibilities which you are shouldering with the result that things are not moving as they should have. You must be helped. We must set everything in such a way that the younger ones get opportunities to be trained up for the administrative work and can replace the venerable ones as and when they will be no more active or able to do their work. Ashram must carry on The Mother’s flag and continue Her work of Physical Transformation, undisturbed by any circumstances. The Mother had prepared a strong and beautiful base for the Ashram and its administration. But the times have changed and we must make some re-adjustment in view of our experiences in the past 7 years. I present a plan of strong and efficient Ashram administration. The main set up may be as follows. 1. THE MANAGING TRUSTEE: in consultation with the Board of Trustees, will take final decisions on every important matter. The Board of trustees will define and give the guidelines and policy. The execution of the actual work should be left to the Coordination Committee and the sectional Heads. 2. THE BOARD OF ADVISERS: composed of 4 to 6 elderly sadhaks, with character, experience and integrity, will advise the Board of Trustees on various matters. They will also act as (i) the committee for new admissions to or expulsion from the Ashram and (ii) committee for New Publications. 3. COORDINATION COMMITTEE: composed of 4 to 6 younger sadhaks, with intelligence and far-sight will make on the spot enquiry / study of every problem and report to the Board of Advisers. Note: Except for Prosperity, no member of the Board of Trustees/Advisers should be burdened with the responsibilities of any particular section or department. 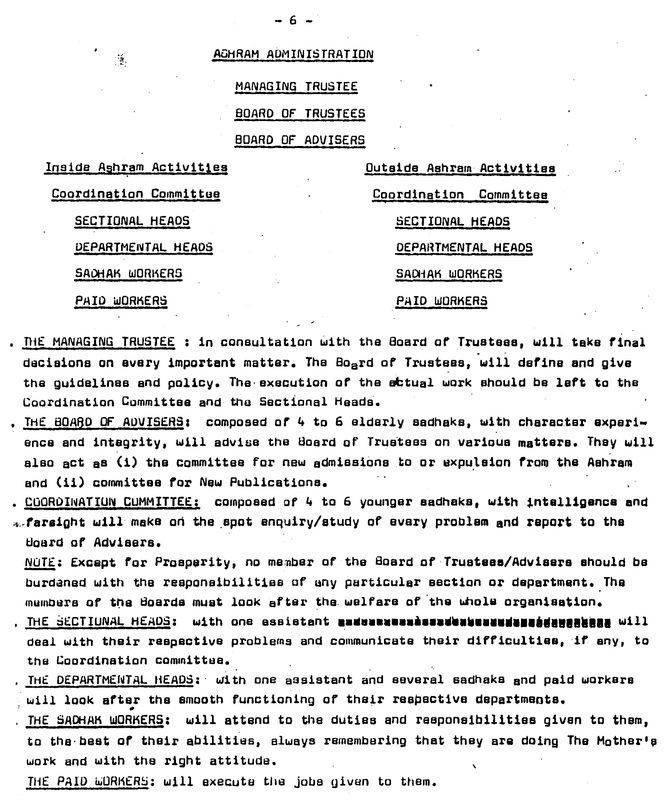 The members of the Boards must look after the welfare of the whole organisation. 4. THE SECTIONAL HEADS: with one assistant will deal with their respective problems and communicate their difficulties, if any, to the Coordination committee. 5. THE DEPARTMENTAL HEADS: with one assistant and several sadhaks and paid workers will look after the smooth functioning of their respective departments. 6. THE SADHAK WORKERS: will attend to the duties and responsibilities given to them, to the best of their abilities, always remembering that they are doing The Mother’s work and with the right attitude. 7. THE PAID WORKERS: will execute the jobs given to them. Note : a. The secretariat of the Board of Trustees, Board of Advisers, and Coordination Committee can be accommodated in the ground floor of Shri Counouma’s house. b. All intimations must be done in writing and papers must be properly filed for ready references. It goes without saying, that this scheme, like any other scheme, will be successful, only when there is a good leadership and obedience to leadership on one side, and perfect goodwill and understanding on the other. 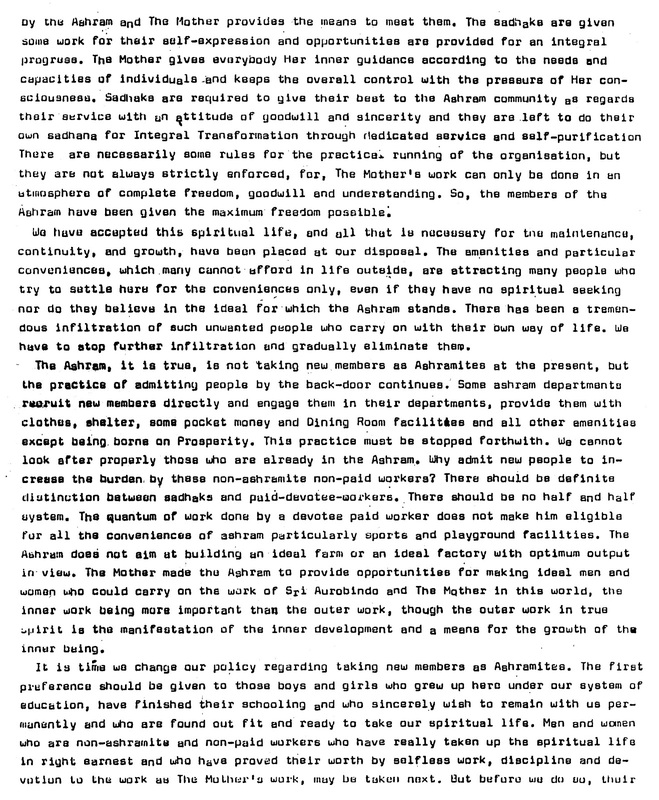 P.3 Para 1-2: Policy regarding taking new Ashramites ─ only after Ashramites properly looked after. ii) Non-ashramites and non-paid workers, earnest and of proved worth by selfless work, discipline and devotion. Antecedents to be verified. Medical check up, Screening of political affiliation, country of origin and connected or come this way. P.3 Para 2: No waste of resources - every project to be thoroughly examined from all angles. 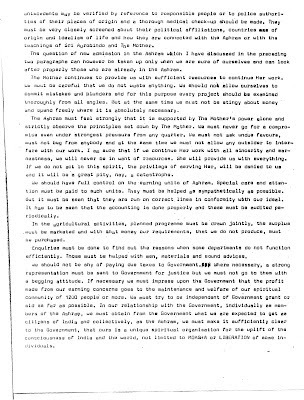 P.3 Para 3: No compromise of principles, no undue favours, no begging, no outsider to interfere. P.3 Para 6: ‘Sick’ departments ─ enquiry of the reasons behind, Help by men, material, sound advice. 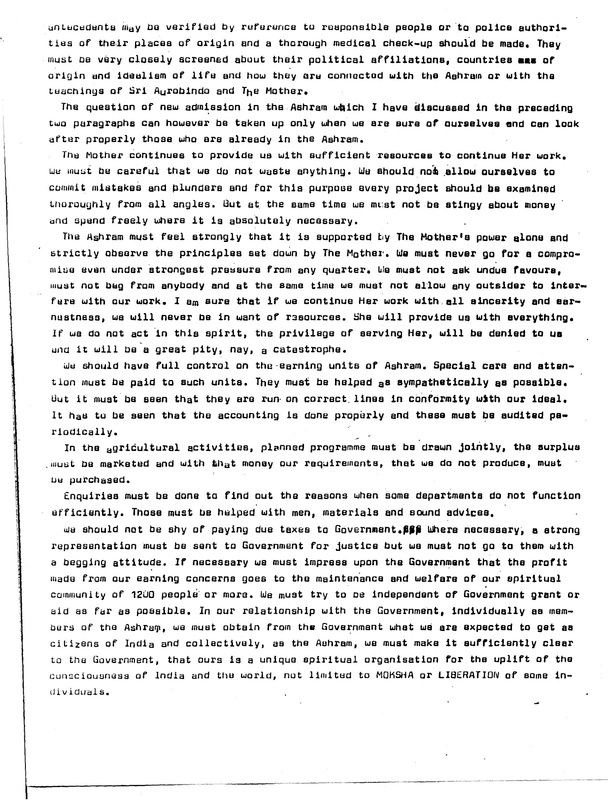 P.4 Para 1: Sundry businessmen ─ Inform Government and concerned departments; Ashram has no connection with such people. 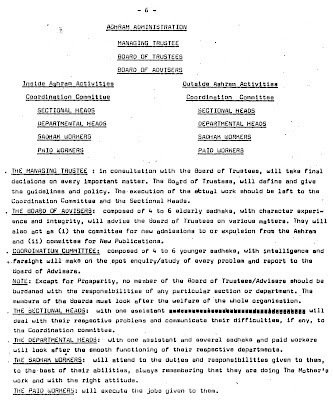 P.4 Para 6 and 8: Reception Service ─ Open round the clock. Gate-duty persons chosen from people of amiable and helping attitude. No rudeness to visitors. Gate-keepers (paid) chosen with care. 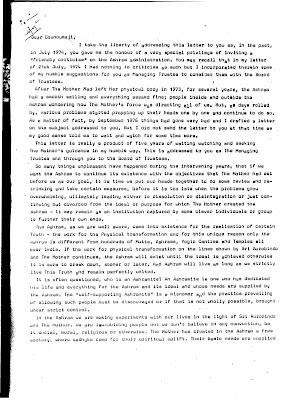 P.4 Para 5: Business Transaction in Ashram Main Building ─ No, except for Books of Sri Aurobindo and The Mother and their photographs. P.4 Para 7: Guest Houses ─ open for people who come to Ashram only. P.4 Para 9: Needs of Sadhaks especially old ones and those having no other means ─ Sympathy and consideration. P.5 Para 1: Injustice to sadhaks ─ Never. No personal grudge should influence cases of periodic carelessness or indifference. P.5 Para 3: Ashram Security ─ A retired knowledgeable officer in charge of volunteers and paid guards. P.5 Para 5: Constitution ─ Amend suitably, print revised edition. Administration ─ Tone up, opportunities for younger people’s training.